A. Smith Bowman Distillery is announcing the second release in its Experimental Series, which includes distilled spirits from a wide range of expressions, separate from its Abraham Bowman whiskey releases. This experimental release features a rum titled Virginia Rum. Virginia Rum was distilled on Sept. 7, 2017 utilizing A. Smith Bowman’s custom microstill, George, installed in early 2015. The rum was made from select black strap molasses and evaporated cane juice, and was aged in used bourbon barrels. It was then bottled at 114 proof, or what is known as “Navy Strength.” Many rums have historically been presented at this proof, which was chosen for this release as a nod to Virginia’s strong military ties. This very limited, one-time release will only be available at the A. Smith Bowman Distillery Visitor Center. 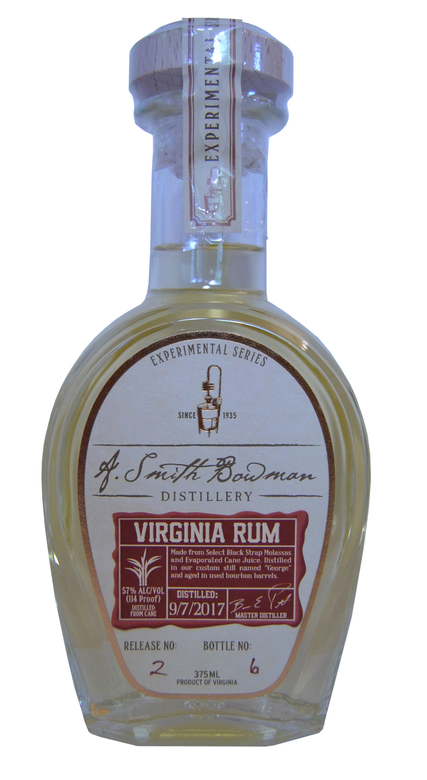 Virginia Rum will be offered for sale at the A. Smith Bowman Distillery Visitor Center in Fredericksburg, VA on Saturday, July 21. It is very limited and is not likely to be repeated, however; new experimental spirits will be forthcoming. A. Smith Bowman Distillery, well known for making-award winning bourbons, including two of the World’s Best Bourbons, expanded its offerings to include a new line of experimental spirits in 2016. The first Experimental Release introduced the limited edition Rye Expectations Gin. The series will include a wide variety of distilled spirits, including the aforementioned gin, the newest Virginia Rum release, and will grow to include many different expressions of vodkas, brandies, gins and rums. The Experimental Series explores a wide variety of spirits delving into unique recipes, wood types, exotic fermentables, and the use of local ingredients such as grapes, apples, pears, grains, and much more. The Experimental Series bottles feature a small rectangle label on the front of each release explaining the provenance along with a hand numbered release number and bottle number. Virginia Rum is bottled in 375 mL and will be priced at $34.99. It is 114 proof. A. Smith Bowman's distilling roots date back to the years before Prohibition when the Bowman family had a granary and dairy farm in Sunset Hills, Virginia. They used excess grain from the family estate to distill spirits. In 1934, after the Repeal of Prohibition, Abram Smith Bowman and his sons continued the family tradition and built a more modern distillery in Fairfax County, Virginia called Sunset Hills Farm. The Distillery was moved in 1988 and is now nestled in Spotsylvania County near the city of Fredericksburg, 60 miles away from the original location. As a small and privately owned company, A. Smith Bowman Distillery continues the time-honored traditions on which it was founded. Considered a micro-distillery by today's standards, A. Smith Bowman produces an assortment of hand-crafted spirits distilled from only the finest natural ingredients and using the latest technology. This micro-distillery focuses on the production of premium spirits honoring the legacy of Virginia's first settlers. Its various brands have won more than 100 awards in the past five years, including “World’s Best Bourbon” in 2016 for its Abraham Bowman Port Finished Bourbon and again in 2017 for its John J. Bowman Single Barrel at the World Whisky Awards. For more information on A. Smith Bowman, please visit www.asmithbowman.com.